Field Names:Conduit clamps, cowboy clamps, mae west clamps, minnies, stand off straps, standard conduit clamps, minis, pipe clamps. These universal strut clamps are used to mount EMT and rigid conduit from strut channel. Topele’s two piece construction provides a tight fit in strut. 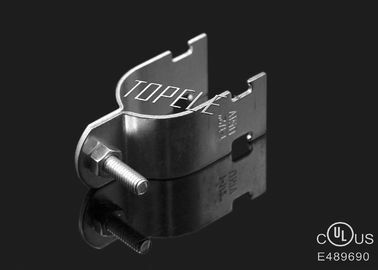 Additionally, their screw tight clamping action secures conduit in overhead strut channel or wall mount applications.electric clamp,electrical clamp,fitting clamp,pipe clamp,steel clamp,galvanized clamp,metal clamp,Strut Channel Clamp,The zinc plated steel provides durability and corrosion protection. +Quick Delivery: 30 days for one 20ft container.